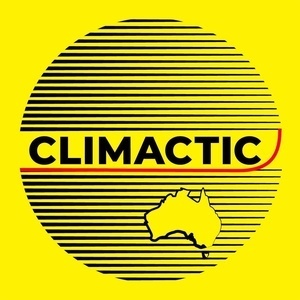 Climactic started as a way to hear more stories from the community of climate-concerned people in Australia, and the wider South Pacific, in April 2018. 9 months on, with 50+ episodes published, the team is growing, with new, diverse podcasters joining what is now a collective, dedicated to the stories of the everyday people who inspire, support, and constitute this community. 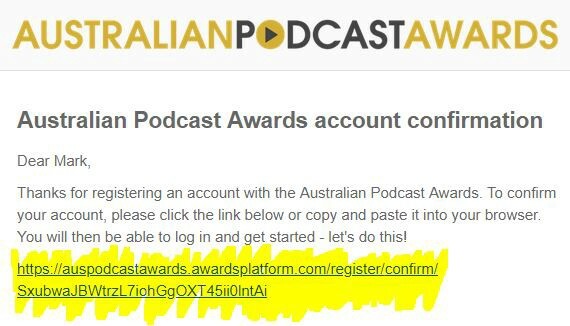 We’d never have dreamed that after only such a short amount of time, we’d be going for an Australian Podcast Award. But we got called out by a past guest and huge supporter of the show. She said, ‘why can’t I vote for you in the popular category of the podcast awards?’. And we had no good answer for why she couldn’t. So we have thrown our hat in the ring, and, with a fresh shot of confidence, believe we might be able to swing a victory. 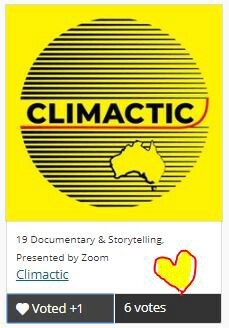 For a climate change podcast to take the popular vote, it would show that in the new media space, like in so many other parts of society, 2019 can be the year of climate change action. Vote for us. Vote because you’ve listened, vote because you love and support our guests, vote because you want strong voices on the climate. 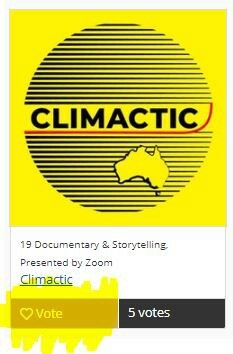 Share, because those working against climate change don’t have marketing budgets. Because your friends might care just as much as you, or more than you, or more than you’d think. 3. You’ll be asked to create an account. This is to ensure that votes are done by real people. And that’s good, because internet bots are not going to be of much help in fixing the climate crisis, we need people, like you, for that! 4. You’ll be sent a link to confirm your email address is real. Just go to your inbox, find it, and click the link. Once you’re here it’s just one more step! 5. 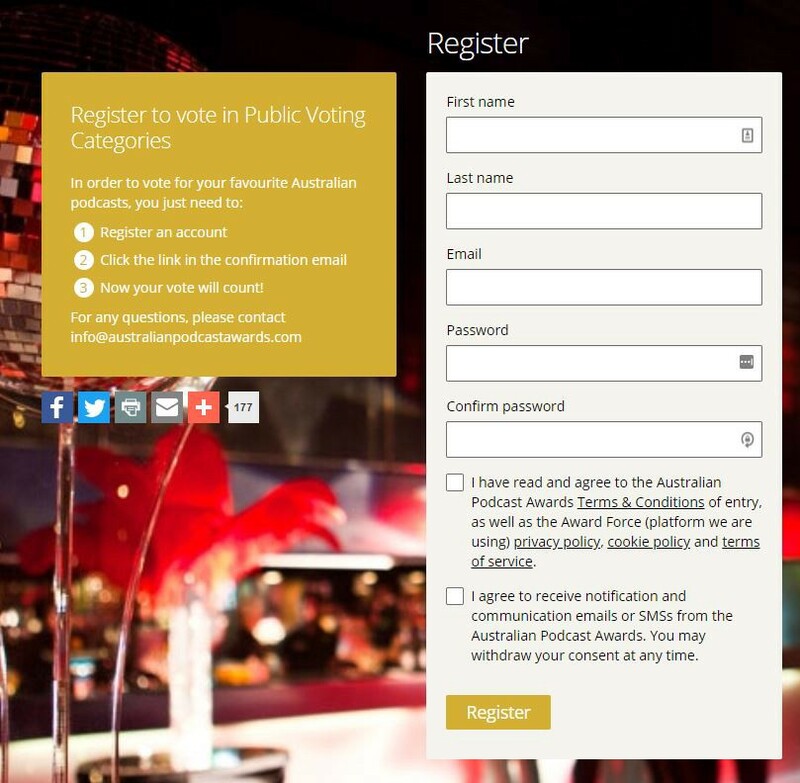 The link takes you to this page on the Australian Podcast Awards website. When you see this just scroll down. Thank you so much for voting, for listening to the show, for supporting us. We’re so grateful for the opportunity to be doing this, and are so glad to be able to be of some service to this community of people doing amazing things for the sake of us, future generations, and a safe climate. Thank you. Thank you. Thank you. Please share the word! — Mark, on behalf of the Climactic team. Rich, Hazel, Maxine, Georgia, and Bronwyn.